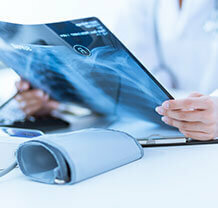 The department of Radiology offers unparalleled resources in the region. A full array of diagnostic and imaging-guided interventional services is provided within the hospital’s premises. Equipped with the latest state-of-the-art technology like the 3.0 Tesla in a beautiful, comfortable environment, perform advanced image processing to support clinical care with the highest quality resolution. The greatest strength of this department is the people. Emirates Hospital has taken extra care to hand pick the professionals humming behind the day-to-day functions of this department to ensure our patients receive nothing but the best.